Born and raised in France, Yohann, although very good in education, grew tired of tests and exams and wanted to pursue his passion for hospitality as soon as he could. Realising it was more about experience than qualifications, he started working aged sixteen in some of the most prestigious hotels in the world, including The Dorchester and The Plaza Athenee. Inspired by the arts, Yohann loves to experiment with his cocktails and drink combinations to provide a unique offering for his guests to experience. Leaving hospitality to sell Curio Gin, a Cornish company based on the Lizard peninsula, he soon missed the buzz of hospitality life. 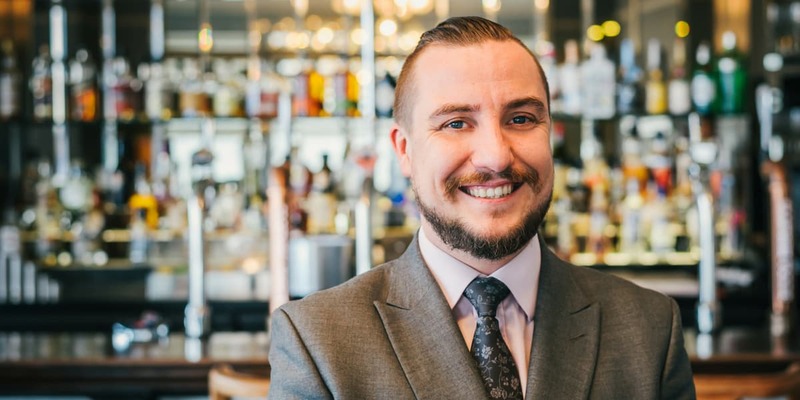 Knowing The Greenbank Hotel’s outstanding reputation, Yohann discovered an opening for an Operations and Bar Manager role and has been working for here for just over a year. Recently, Yohann has been offered to work at both The Greenbank and our sister hotel The Alverton in Truro, as Food and Beverage Operations Manager. WHERE would you recommend going for food in cornwall? I love trying new places – especially in Cornwall. I really like Kota in Porthleven. I love the way Jude, the Head Chef, fuses European and Asian flavours together. Simply perfection. What’s your favourite thing to do in the summer? Surprisingly, it’s not something in Cornwall! I actually love going to Malaga in Spain, as it is my partner’s home city. I just love it there. The food, drinks, everything is perfect. A great little holiday. Falmouth is really trendy – there’s always up-and-coming bars and restaurants, with quirky qualities that help create their own personalities. It’s always exciting and I love the vibe it provides. I don’t have a favourite, as I like to drink something different every time. That’s the beauty of cocktails – even with the same ingredients you can make something that tastes wildly different.